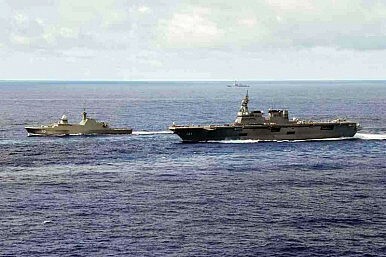 RSS Steadfast (left) leading the Multinational Group Sail with two other warships from Japan and the United States. City-state frigate leads two other warships from the United States and Japan to the world’s largest international maritime exercise. A Singapore frigate has become the first non-United States Navy ship to lead a multinational group sail at the world’s largest international maritime exercise, the country’s defense ministry announced this week. The Republic of Singapore Navy (RSN)’s Formidable-class frigate RSS Steadfast led two other warships from the Japan Maritime Self-Defense Force and the United States Navy (USN) in a sail from Okinawa, Japan, to Hawaii, USA from 18 to 29 June to participate in the biennial Rim of the Pacific (RIMPAC) exercise. The United States meanwhile led the three other multinational groups sailing from San Diego and the western Pacific Ocean which comprised 22 vessels, according to a USN press release. Hosted by the USN, RIMPAC 2016 takes place from June 30 to August 4 in and around the Hawaiian Islands and southern California. In preparation for the sea phase of RIMPAC 2016, during the group sail the RSN conducted naval warfare serials with the two other naval ships en route. According to a statement released by Singapore’s defense ministry, the RSS Steadfast, with an embarked S-70B Seahawk naval helicopter, led the conduct of helicopter operations, surface warfare drills, gunnery firings as well as maneuvering and communications serials. The Commanding Officer of RSS Steadfast, Lieutenant Colonel Ooi Tjin Kai, said that the multinational group sail presented an opportunity to strengthen partnerships between the navies. “The exercises at sea help to build confidence in operating with one another. As commander of a Multinational Group Sail, the RSN plays an important role in catalyzing cooperation between the participating navies and we are glad to be able to value-add to the interactions,” he said. This is the fifth time Singapore is participating in the exercise, which was first held in 1971. RIMPAC 2016 will feature 27 countries, with 45 ships, five submarines, and more than 200 aircraft and 25,000 personnel. This year’s exercise is expected to feature a submarine rescue portion.